Why would we want to make ginger syrup? Well, to start with, my family used to be a bunch of pop addicts. This came from my “couponing” days, when I would find great deals on pop of all kinds, and buy it just because it was a great deal. I have reduced the amount of pop we drink. I don’t like the high fructose corn syrup or artificial flavors. The amount of sugar in a can of cola is 3 Tablespoons! That’s enough sugar for an entire day for a person. Too much sugar can cause your immune system to get sluggish. It can also lead to diabetes, tooth decay, and hormonal imbalances. I knew I wanted a healthier life for my family, so we had to cut the pop out. When we DID drink pop, it was usually ginger ale. My kids, hubby and I all loved it. I liked the spicy flavor, and the fact it was caffeine free. While transitioning from the bottled soda, we bought a soda stream. However, the syrup add-ins are full of high fructose corn syrup, preservatives, and other stuff I really don’t want my family to have. The next best thing? Make my own ginger syrup to add! This ginger syrup is the perfect syrup to make for homemade ginger-ale. I tried it, we loved it, and so I decided to make a huge batch to have on hand all the time. It starts with a ginger simple syrup recipe. That is equal parts of sugar and ginger infused water. Some of our favorite ginger syrup uses are for upset stomachs. 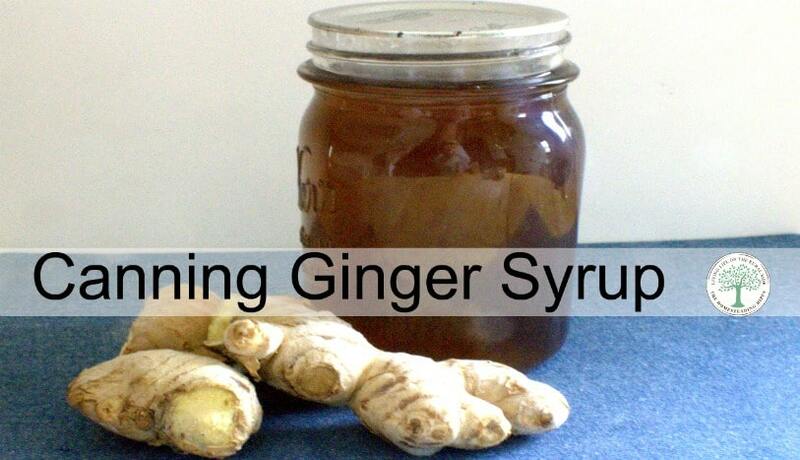 Just one teaspoon of this ginger syrup helps to settle upset stomachs. The ginger syrup itself is easy to make. You could easily cut this recipe down for smaller batches. If you need to make a smaller batch of ginger simple syrup, just store it in the fridge. You could also add a bit of mint extract to the finished syrup, or when adding to carbonated water for a special kick. I like to have a lot on hand, therefore, I make a huge batch every time we need it. Begin by cutting up two big hands of ginger. A hand of ginger refers to a piece about the size of your hand. You can find them “hand sized” in the grocery store produce aisles. What you want is about 8 ounces for this ginger syrup recipe. In a large stock pot, bring to a boil 6 cups of water and 6 cups of sugar. Add cut ginger. I don’t usually bother to peel the ginger for this recipe. If you choose to do that, try and source organic fresh ginger. Bring the ginger syrup to a boil, boil 10 minutes. Turn off heat, cover, and allow to steep for 90 minutes. After steeping is done, drain the ginger syrup into another pot. Bring syrup back to a full rolling boil while jars are in a boiling water bath. Fill pint sized jars to 1/4″ headspace and process for 30 minutes. To use, add 1/2 cup per 1 liter of carbonated or mineral water. Have you ever made a ginger simple syrup recipe? What would you use it for first? About how much ginger in weight? this was 2 biggish hands…I can’t say for sure the total amount. maybe 12 ounces total? Is it possible to use Stevia or some other sweetener instead of sugar? Trying to keep sweetness but not give my husband diabetes with so much sugar in foods. if you are making a small batch to use right away, I don’t see why stevia wouldn’t work…However, I am not totally sure of the safety factor with stevia in canning. If you need to use an alternative sugar, just make enough to use within a week or two. Can these be processed in a water bath? Since this is low acid, shouldn’t you include instructions on how to acidify it in order to make it safe for water bath canning? Sugar is not a “preservative” and does not prevent the growth of botulism spores. There is only ginger infused water and sugar. A basic simple syurp. there is no need for pressure canning of simple syrup. If you’re still concerned, add 1/4 t. of lemon juice to each jar before you put the syrup in it. Problem solved. Using the 2 hands of ginger how many pints of syrup would you get to can ? I would want to have enough jars ready for use. one hand of ginger gave me about 10 pints of well flavored syrup. 10 pints, from 6C water and 6C sugar? Did you add any extra water? I like your idea of making the Simple Syrup and having it ready-to-go in the pantry. I keep a small jar of Ginger Bug on my counter and when I need a “sweet hit” I dip the tip of a spoon into it and savor the flavor! So satisfying! How long can the ginger bug sit out? Do you strain it or just let it keep fermenting? Do you add sugar/water? If so how often/how much? Do you use it for “soda”? this isn’t a ginger bug. It’s ginger syrup. The difference is that this ginger/sugar/water isn’t fermented. I am thrilled to find your ginger syrup recipe. YUM. I will pass it on to my friend who is crazy for it too. Love ginger. Great if one has an upset tummy too. Thanks for sharing your recipe Heather. Looking forward to cruising the rest of your site. I live in Miami & grow ginger in pots. I get big batches of ginger at a time & make ginger syrup that we use instead of maple syrup. Also use ginger syrup in tea for almost-chai. Thanks for canning info!